Martin Schepers works were in the past influenced by mountains, seaside or the limited space in simple wooden boxes as well as the endless expanding town Los Angeles, where he stayed for six month. In 2009 he has started with a series of pictures in various sizes and techniques as oil on canvas, drawings with pencil, coal and ink and some watercolours. 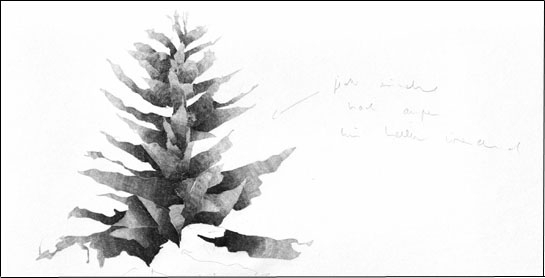 Two fir trees in a private garden were the starting point. These works will be exhibited for the first time. Martin Schepers (*1979) lives and works in Berlin. He studied at both the Kunstakademie Munster and the Kunstakademie Duesseldorf, where he graduated as a Meisterschüler of Prof. Siegfried Anzinger in summer 2006.